As summer begins winding down, many New Yorkers are sad to see the long, warm summer days slipping away; not this girl. I’m ecstatic for the next few weeks for a couple reasons. First, I gladly welcome the slightly cool, breezy weather. Second, I’m going to France for two weeks for a much-needed vacation. And third, I am attending the Gluten & Allergy Free Expo (GFAF) September 6th -7th in Secaucus, NJ. Tons to look forward to! It’s my first time going to the GFAF expo both as an attendee and a featured blogger covering the event. It’s the largest and fastest growing special diet consumer event in the country. Started in 2007, the event is professionally managed and have expanded from one to seven cities throughout the United States. In addition to meeting the needs of the celiac disease community, the expo welcomes those with gluten sensitivities, auto-immune/inflammatory diseases and autism. Having celiac disease, I am eager to attend the sessions where gluten-free experts like Kathy Smart, Carol Kicinski, Amy Fothergill, Vanessa Maltin Weisbrod and more will be presenting. I believe in order to live a healthy gluten-free lifestyle it’s crucial to be your own health advocate by staying current with medical research and studies, always reading food labels, and not being afraid to question what’s in your food and especially to spread the truth about what celiac disease is. Of course, I can’t wait to fill my goody bag chockfull of delicious gluten-free snacks, treats and anything edible I can get my hands on. There are over 150 vendors both national and local to the expo area so you’ll definitely see some familiar names like Udi’s, Glutino, Schar as well as gluten-free companies that are local to the New Jersey area. The possibilities are endless! 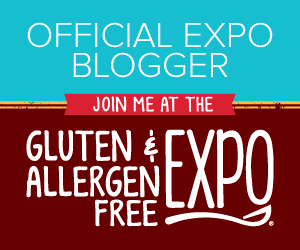 As a featured blogger at the GFAF expo, I can giveaway 4 free tickets to the event! If you or someone you know would like free tickets please send me an email at glutenfreesteph@gmail.com. I will also be live tweeting from the event with delicious food pictures, interesting facts from the sessions as well as any other gluten-free shenanigans! I look forward to seeing you there. Even though I am a gluten-free-eating newcomer, the event sounds very interesting! Good to know there are places where you can discover new ingredients, products, meals and recipes to use later in your ordinary life in order to eat better. And have greater variety. I cannot wait to read your blog post about it, please, try cover as much as you can! Pictures included! I wonder if the experts can give the people advice on how to be confident when questioning what’s in your food all the time. The other thing that strikes me are the restaurants that claim to serve gluten-free dishes, but in fact are not. There are many of them, I know you know. Especially judging on your last post on how you almost got glutened! This article, Gluten Free Restaurants, talks about the issues with seemingly gluten-free restaurants as well, quite interesting read. Would just raising the consciousness about the dangers of gluten for concerned people help? Maybe there should be some sort of controllers charged with attending the so-called gluten-free restaurants who would check whether it is indeed safe place. Otherwise, I would just have to rely on my own cooking.